The ideals of the International Baccalaureate Organization (IBO) focus on every student becoming an independent, creative, critical thinker, and lifelong learner. Students will also learn to relate acquired knowledge to the outside world on local, national and international levels, and to everyday life. 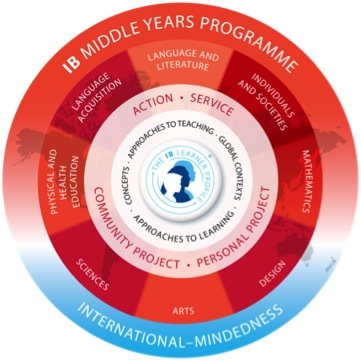 The International Baccalaureate Middle Years Programme (MYP) provides a framework of academic challenge and holistic education for students aged 11-16. The MYP at Concordian spans the three years of Middle School (grades 6, 7, 8) and the first two years of High School ( grades 9 and 10). The educational approach of the MYP embraces traditional school subjects and promotes meaningful interdisciplinary relationships. The MYP provides the framework of challenging standards and broad based and specific skills that encourage each student’s individual growth towards self-reliance and responsible participation in society. The MYP is a challenging and engaging program of study that asks students to take responsibility for learning, to work with others in teams, and to explore new ways of learning about and understanding the world around them. The MYP does more than allow students to learn in subject areas. The MYP Programme is based on three very important ideas: integrated learning, global engagement, and intercultural understanding. Learning in MYP does not limit learning to subjects, like boxes that classify knowledge in separate spaces. Knowledge is learned by making connections between subjects, between people, between the concepts and the world. The world is connected in many ways, so that what we do in our personal lives has impact on other people in other parts of the world, as well as in future times. MYP learning helps us to become active learners who develop our ideas, skills, and actions towards personal values that can lead to principled action and understanding of peoples’ “shared humanity” (IB Mission). The world is interconnected through lines of communication but also through shared experiences made easily available to us through travel, media and living and working in different countries. To be a successful member of the global community, we have to learn how others think, to be open-minded to different perspectives, and to make connections with others in our community as well as beyond the school walls. Here at Concordian, we believe that students have to take moral leadership and be compassionate in order to make a difference in the world. We learn this in MYP through different experiences including service and other learning activities. The IB-MYP offers one of the highest quality educations available on an international level. It is excellent preparation for the rigorous IB Diploma Programme offered in the eleventh and twelfth grade.